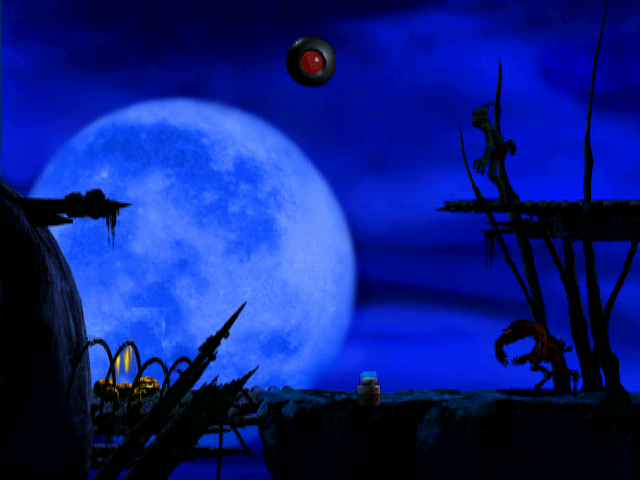 Oddworld is a unique idea; even with its old age, not many games tried to do the same thing as it did. It's a platforming puzzler game where you have to escape an evil factory while at the same time attempting to rescue your friends. Your character has close to no weapons - bar grenades you find in dispensers, an array of keywords you can say and a mysterious chant - and your enemies are many and pretty dangerous, with their guns and mines and other lethal means to stop you. The game starts with a simple tutorial of how to play it. You move with left/right, jump with up. duck with down, the numbers all activate a different voice command, shift runs, space leaps, control 'uses' things... This is a complex game, and animation priority is my biggest issue with this. Your character doesn't move as much as it 'animates' in the world. You can't cancel out of anything, and if it means you have to run, stop, crouch, activate a mine, turn around and jump out of the way before an enemy kills you, you have to be pretty good. I actually stopped playing at such a situation, where I wasn't able to proceed. The voice commands are used to interact with friendly NPCs in order to bring them to a bird portal so they can escape, there are 99 others to rescue and leaving an area without saving them all means they'll get killed, so you have to do it more or less in one go. 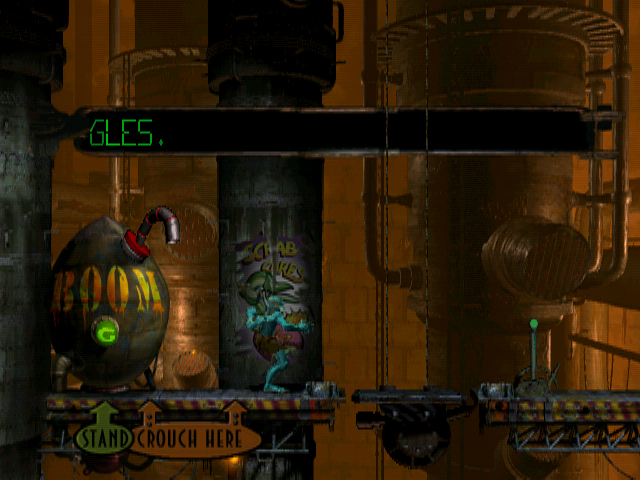 These are optional puzzles and they test most of what you know about the game, since you have to be careful not only with your own well-being, but with the safety of dumb AIs that follow very basic instructions, such as "follow me" and "hello". Since the core game was giving me trouble, I didn't bother very much with that part, and they all died. Lastly, although you will probably die a lot, the game is quite stingy with checkpoints, sometimes you'll have to redo multiple rooms a few times because you can't figure out what to do in the last one. Since the game is a puzzle platformer with high priority on animations - less so on fluid controls - it should have been more forgiving with its checkpointing. At least there is no game over screen and you can retry as much as you want. In any case, O:AO is an old game, it's the kind of game I would've rented from the library when I was in high school, that doesn't prevent it from being interesting and unique in it's own way. Although I recognize that, it's not really my cup of tea.